Testimonial: The importance of finding an appropriate solder fume extractor - Sentry Air Systems, Inc. In 2009, Pro Audio LA was experiencing rapid growth. The hours spent soldering and assembling custom professional audio cabling increased, and they quickly realized that their current table top fan would not sufficiently push solder fume away from their technicians. Knowing that solder fume contains hazardous oxides that should not be inhaled, Pro Audio LA searched for a solution that was safe, efficient and would help follow OSHA requirements. Their search led them to Sentry Air Systems where they purchased their first fume extractor unit [SS-200-WSL]. Unfortunately after a few months of working with it, they determined that particular unit probably wasn’t the best fit for their operation. Every customer comes to us with a unique need or problem, and it is our responsibility to use our knowledge and experience to recommend an appropriate solution. More importantly, we are honest when we feel our products could not safely or adequately solve their needs. When Pro Audio LA wasn’t happy with their initial purchase, our sales team worked diligently and swiftly to get them the right product. Once they swapped out their initial unit for a 60” wide Ductless Fume Hood, Pro Audio LA was immediately impressed by the hood’s performance and durability. The added security of knowing their hood is extracting and filtering out hazardous solder fume has brought their staff and ownership peace of mind. When asked to describe their experience using our hood, Pro Audio LA didn’t hesitate to praise its durable construction and consistent performance. The size of the hood allows two soldering technicians to comfortably work side-by-side, and Jason notes that the hood operates “relatively quietly”; which helps their technicians communicate without raising their voices. Additionally, the hood has contributed to Pro Audio LA’s overall professionalism and credibility as an established business. We are always excited when previous customers call on Sentry Air to provide additional equipment for their business. Not only are their companies growing, but they have confidence in our products and truly find them helpful. Pro Audio LA is comprised of a small group of professional audio engineers, audio technicians, and integration experts. Their cables are hand-made from the highest quality components available. They offer some of the best professional audio and recording equipment on the market, and are committed to providing the tools that will breed better music, better sound, and an easier work flow. For more information, check out their facebook and twitter accounts. 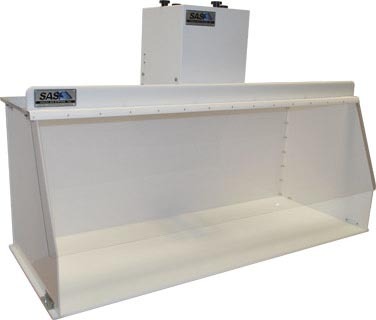 For more information on solder fume extraction units, contact Sentry Air at 800.799.4609, visit our website, email sales@sentryair.com or fill out the feedback form below.